I am always amazed at how seemingly not much prompts thoughts. And so it was as I was doing a bit of cleaning and decided to move some furniture. Tucked in a corner as it has been for oodles of years was a small table. For some reason I really looked at it and memories can flooding in almost faster than I could absorb them. The base was a wooden nail keg. The top a piece of polished Iowa black walnut. It was made for us by Mom and Dad. I didn’t do much more cleaning as I decided I should look up some information on nail kegs. 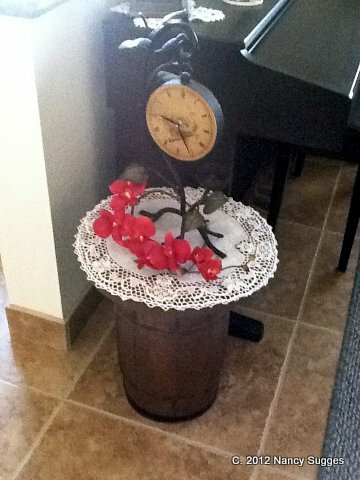 My first site on the internet was to tell me wooden nail kegs are now antiques. If anyone reading recalls when there was a Burgess & Sons, Inc. in Lime Springs you might also recall the small room office at the front with doors in all four directions. I mostly went out the rear to the nail room as bin after bin of nails and the wonderful scale fascinated me. I played out there until Dad asked me if I would like a job. My job was to check all the bins and be sure no one had mixed up the nails. It was a perfect job for me. Long, short, fat, thin, galvanized, non-galvanized, 2 penny, 4 penny, I loved them all and spent hours on my hands and knees putting the bins in perfect order. The nails all came in these small wooden kegs. It was better than any gift to get the crow bar and be allowed to open the kegs and empty them into the bins. The nail room had its own smell. I loved it. I grew older and eventually was asked to do more work in the office with filing. A joy was listening to the customers coming in with an idea of what to build or repair and Dad solving their needs to mutual satisfaction. I still went to the nail room and would quickly fix bins that were messed up but it was no longer my main reason for being at the lumber yard. If you happen in to Home Depot notice how they sell nails. There is no smell and there surely is no scale – just a bar code.